The future of geopolitical double-jumping is almost upon us. Sledgehammer have kitted out the Steam page for Call of Duty: Advanced Warfare in preparation for its release in two weeks’ time. Most notably, they’ve handily affixed a bunch of specifics about what needs to be on the inside of your PC to run it. Advanced Hardware might power protagonist Private Mitchell, but the system requirements for his game look relatively modest – particularly when compared to the excessive VRAM requirements seen in other cross-platform releases of late. That said, 55GB is steep. It’s only a little more than Titanfall asked for – but will doom most of us to an overnight download. 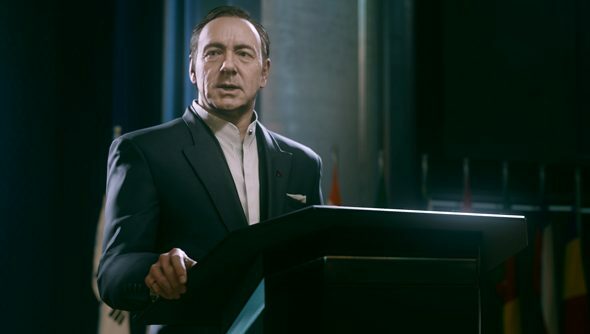 Call of Duty: Advanced Warfare arrives on PC on November 4. But the meantime offers Legend of Grimrock 2, Shadow of Mordor, and Alien: Isolation. Do you think your schedule will be sufficiently clear for you to start thinking about playing a new CoD, come November?